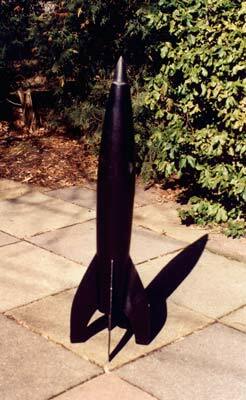 The closest kin to this rocket is the early German Repulsor and Russian style rockets. Actually the fins are from a Big Bertha/Broadsword that has been modified by rounding the knee in the leading edge and curving the trailing edge. It is designed to use the interchangeable motor mount system consisting of 3 units: a 3 by 18 mm cluster, a single 24 mm, or a single 29 mm cartridges which fit into a BT-60 receiver.